Notes: One from the vaults – This Jim Beam Signature Craft Six Row Triticale Bourbon bottle got lost for a bit while I was having a lot of things going on and recently uncovered this on along with its fraternal twin the 11-year-Old Six Row Barley Bourbon. Both were received a good while ago with no compensation or fee – as everything here is – just for the record. Another one of the Jim Beam Signature Series but this one is a distinct departure in that it is an 11-year-old triticale bourbon. Triticale is a rye/wheat hybrid that is rarely used in distilling. We know of a few examples in craft distilling, but it is not used by the larger producers . This may be due to the fact that it needs to be milled in a specific way, or more likely because many people do not know what it is and larger producers may be reluctant to spring something strange on them. In this case, since it is a bourbon it is still at least 51% corn with this being a minor grain ( less than 49 % of the total mash bill). Beam does not state how much triticale constitutes the mashbill. Appearance: Clear as a bell, red mahogany color showing its age but a touch lighter than the barley release of the same age. Taste: A bit of a dry entry with some oak and vanilla notes, chile, dark fruit. But then a bitter, almost waxy bell pepper taste to it develops with a drying finish. A bit lighter in the body than the average Jim Beam product and a bit lighter in the oak influence. 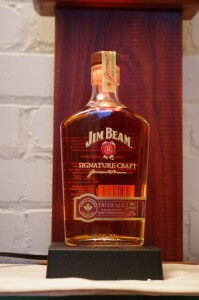 Drinks: Like the triticale itself, Jim Beam Triticale is a bit of a hybrid. Bottle: Flask shaped clear glass bottle shows the bourbon to good effect. Simple graphics are silk screened directly onto the bottle, unlike the earlier series which had a clear plastic applied label. All the labels are easy to recognize at a distance. Small gold on a brown label that goes around the edge of the bottle gives the particulars and distinguishes it from the other signature craft bottling which is gold on red, or gold on black. Back label is a plastic stick on. I’m guessing this shift was to give the bottle a more permanent and upscale feel. The previous incarnations seemed to be a trifle less plush. The neck collar has been done away with on these bottles also with a wooden topped real cork replacing the earlier screw cap. The “None Genuine Without My Signature” paper seal that harks back to an earlier era remains. The overall impression is of a higher end presentation. Maybe they read my critique of the earlier bottles, or maybe not, in either case, they seemed to have definitely made this package look a lot better! Other: The stated price on these was $49 a 375 ML which makes it rather steep. Final Thoughts: I would give this one a pass unless you can find it on sale to add as a reference sample. A very extensive website with lots of links to their wide portfolio. It is interesting to note they only list 2 of the 6 Signature releases on the site. This was not one of them.